The Cyclotron 15p is a 15 MeV proton cyclotron. 15 MeV has been selected to offer a significant 18Fluorine production yield with the investment efficiency of small power costs and low initial cost. As the user moves to other PET radioisotopes, the energy offers adequate production yields of radioisotopes such as 18F (Fluorine) and 64Cu (Copper) with the added benefit of optimized specific activity of the product. The cyclotron system has a small footprint and can be either shielded with integrated (self) shielding or installed in its own shielded room. Production targets for 18F, 11C, 13N, 15O and 64Cu are available. These systems are designed for individual hospital or small regional pharmacy use. Small cyclotrons that produce FDG are designed to take advantage of production reactions that are optimum at low cyclotron energies. Many cyclotrons have limitations in energy or intensity for the production of SPECT radioisotopes. 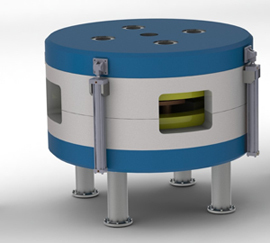 The 25P cyclotron is a mid range cyclotron that is capable of producing commercial quantities of both PET and SPECT radio-compounds. The output from the 25P is ideal for regional radio-pharmacy applications as well as groups requiring sustained SPECT compound supply. The 28 MeV is a negative hydrogen ion cyclotron that has extraction energies of 28 and 20 MeV. The extracted beam current is 400 microamperes and can be extracted simultaneously in any split ratio from two extraction ports on opposite sides of the cyclotron. The opposing beam ports are each separated into a 20 and 28 MeV beam line. 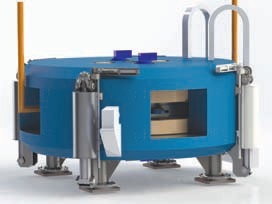 The 28 is the Cyclotron of choice for research institutions requiring a broad range of radioisotopes and a regional radiopharmacy that supports PET imaging centres as well as providing SPECT molecules. Since the 28 can be upgraded to 35 MeV and up to 1000 µA current, the higher energy and higher current allows even more radioisotope production. In addition, these upgrades can be implemented in the field.